Parker says there was nothing he could do to stop himself from mentioning his recent bout with indigestion. 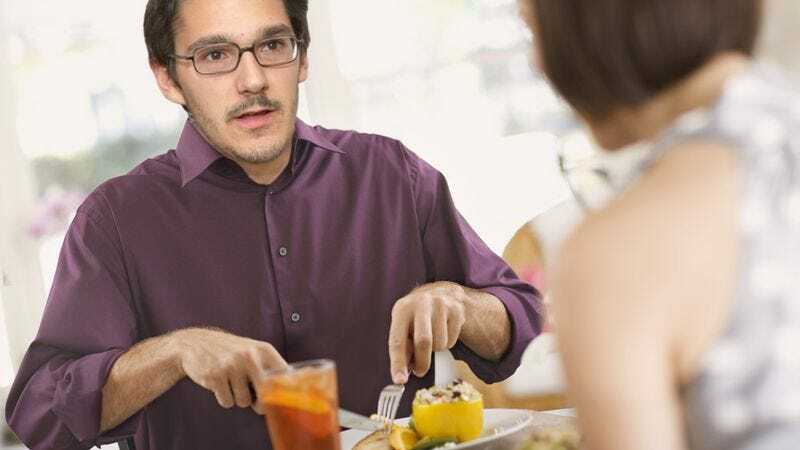 DAYTON, OH—What was intended as a routine first date went horribly awry Tuesday night as local man Kevin Parker, 29, could do little more than stand by and watch himself ruin his chances with 28-year-old Vanessa Carmine. Parker told reporters that the date at a local restaurant began pleasantly and without incident. The two enjoyed small talk right up until the salads arrived, at which point disaster struck, and an unsuspecting Parker discovered he was powerless to stop himself from droning on like an idiot about his recent car troubles. "It was awful," Parker said of the date, his first in more than eight months. "One minute we were getting to know each other, and the next I was sitting there in shock, hearing myself ramble for what seemed like hours about how I'd been meaning for months to get my oil changed, but I kept putting it off, and then when I finally took it in the guy at the auto shop charged me more than the estimate, and how you have to be careful because mechanics are always trying to rip you off, and isn't it a shame that people can't just be honest." "God, the look on Vanessa's face," added Parker, shaking his head. "I'll never forget it." As soon as he realized what was happening, Parker sprung into action, attempting to rescue the evening with amusing childhood anecdotes, but only exacerbating the situation by discussing his parents' divorce and his former bed-wetting problem. After knocking over a glass of wine as he asked Carmine where she was from, Parker realized saving the night from total disaster might be beyond his power. Summoning his strength for one last heroic effort, Parker said he began talking about his dog, found himself unable to discuss anything beyond how the pet had been his only comfort during a break-up last year, and then proceeded to spend five minutes explaining how he was "totally over" his ex-girlfriend now. "There was this loud, disturbing noise, and I realized it was my own voice," Parker said. "I remember looking around the room thinking, 'For God's sake, somebody do something!' Then I just sort of went numb for a few minutes there as I watched myself talk about my laundry schedule." "At one point, Vanessa got up to use the restroom, and I thought that maybe she wasn't coming back," Parker continued. "That it would finally all be over." When the unthinkable happened and Carmine returned, Parker gave up all hope and began sweating through his dress shirt while talking about his love of death metal. "The entire date was a massacre," Parker said. "The waiter couldn't even make eye contact with me. He knew what was happening. He should have thought to bring the check instead of the dessert menu. Or at the very least, he should have kept me from prolonging the agony by ordering the apple dumpling and offering to split it." "I wish I could forget everything I witnessed here tonight," Parker added. "But it's burned in my memory forever." At press time, Parker was walking Carmine to her car, insisting it was no problem despite Carmine's protestations that it was not necessary.